Deep Purple Biography, Discography, Music News on 100 XR - The Net's #1 Rock Station!!! Deep Purple is one of the longest running bands in music history, with over 100 million albums sold and one of the most acclaimed and influential Hard-Rock acts of all time, the group was formed in 1968 in Hertford, ENGLAND by vocalist Rod Evans, guitarist Ritchie Blackmore, bass player Nick Simper, keyboardist Jon Lord and drummer Ian Paice. The group's debut album, "Shades Of Deep Purple", appeared in 1968, soon becoming a smash hit in the United States where it peaked at #24 on the Official Pop chart helped by the hit single "Hush", originally by Joe South, which rose to the #4 slot on the Pop Singles Sales chart. By early 1969, the quintet released their second LP, "The Book Of Taliesyn", reaching the #54 in the States; the record spawned another cover single, Neil Diamond's "Kentucky Woman", which cracked the American Top 40, plus a minor hit, "River Deep, Mountain High". The same year, Deep Purple also recorded and released their self-titled album scraping the lower reaches of the U.S. chart. Both Evans and Simper were excused from the band shortly before the dawn of the '70s, replaced by Ian Gillan and Roger Glover, respectively. They recorded "Concerto For Group And Orchestra" with The Royal Philharmonic Orchestra, an ambitious experiment that unfortunately failed to reach a substantial audience; nevertheless, the originality of the project helped keep the band's name in the public eye in the U.K. for the first time. 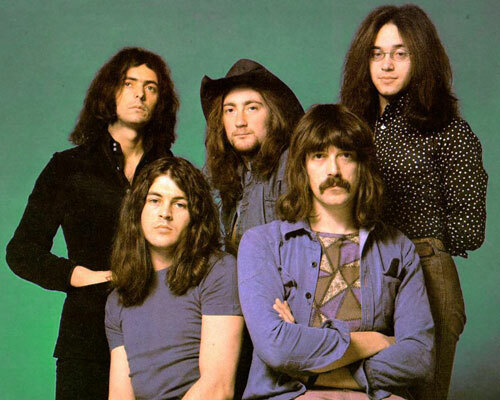 With this line-up, the most celebrated in Deep Purple history, the group scored a stream of successful singles and LPs, beginning with "Deep Purple In Rock", which hit #4 at home and made a brief chart entry at #143 in the U.S. upon its June 1970 release; that same month they also left off the non-album single "Black Night", which rose to #2 on the British Pop chart and reached the #66 on the U.S. Pop Singles list. In September 1971 the group delivered their fifth album, "Fireball", it reached the #32 in the U.S. and shot to #1 on the National U.K. Albums chart spawning the top 10 hit single "Strange Kind Of Woman" and a top 20 hit with the LP's title-cut. The follow-up album, "Machine Head", issued in May 1972, took the band to even greater heights and Deep Purple once again found themselves at #1 in the U.K. chart and reached the #7 on the U.S. Pop Albums chart; this record contained their most well known song, "Smoke On The Water", the track with its immortal guitar riff peaked at #4 on the U.S. Pop Singles chart. That fall, the quintet released the double-album "Made In Japan", the set, recorded over three nights, captured Deep Purple's live prowess becoming a worldwide smash; it reached the top 20 in Britain and peaked at #6 on the U.S. Pop Albums chart going platinum. Although the success of the band's 1973 studio record "Who Do We Think We Are! ", it debuted at #4 on the U.K. Official Albums chart and hit the top 20 in America backed by the single "Woman From Tokyo", relations within the band grew increasingly strained and their seventh LP marked the end of the band's highly successful line-up. In November 1973, Deep Purple returned to the recording studio with another new line-up, David Coverdale joined as lead singer after the departure of Ian Gillan, Glover also left and was replaced by bassist+vocalist Glenn Hughes; their 1974's "Burn" rose to #3 spot in Britain and to #9 in the U.S. spawning a minor hit single in "Might Just Take Your Life". They quickly recorded a follow-up album, "Stormbringer", which appeared before the year's end, the set was a bit less successful than its predecessor and it barely dented the top 20 in the States and peaked at #6 on the U.K. Albums Sales chart; this was the last effort of Blackmore, Deep Purple founder guitarist made the stunning announcement in May of 1975, he left the band to form Rainbow with vocalist Ronnie James Dio. Tommy Bolin was chosen to replace him, he played on the group's tenth studio-album, "Come Taste The Band", which was released in October 1975 to poor reviews and sales. During the following year the Hard-Rock icon broke-up, Bolin died of a drug overdose and Coverdale set out to forge his new band, Whitesnake. Deep Purple's '80s reunion shook the world again with a fresh look and with the classic line-up of Gillan, Blackmore, Glover, Lord and Paice; after signing a deal with Mercury in America and Polydor in Europe, they released "Perfect Strangers" in October 1984, the record shot to #5 in their native England and peaked at #17 on the American Billboard Top 200 Albums chart, it included the single "Knocking At Your Back Door" which rose to #7 on The Mainstream Rock chart and the subsequent two Active Rock top 20 hit singles, "Nobody's Home" and the title-track, helped catapult the album to platinum status. In January 1987 the quintet put out "The House Of Blue Light", that failed to replicate its predecessor's success as the tour to promote it flagged; the album peaked at #10 in the U.K. and reached the #34 on The Billboard Top 200 chart, however it generated a couple of Mainstream Rock top 20 hit with Bad Attitude" and "Call Of The Wild". Two years later Gillan left the band again, his replacement was singer Joe Lynn Turner; the fifth line-up of Deep Purple delivered a disappointingly received LP entitled "Slaves & Masters", though it produced "King Of Dreams", which peaked at #6 on The Mainstream Rock Tracks list and the second single cut, "Fire In The Basement", hit the top 20 in the same chart. Ian Gillan returned to the fold for 1993's "The Battle Rages On"; the album was well-received in Britain falling just one position short of the top 20 of the U.K. Pop chart but scraped the bottom of The Billboard 200 and the title-track reached a modest #22 on the Active Rock chart. The band has planned numerous concerts that year but tensions between Gillan and Blackmore began to escalate again pushing the latter out of the band, Deep Purple invited Joe Satriani to join the group on guitar, he spent nearly a year on the road with the newly revitalized band and in 1994 Steve Morse was finally hired as full-time guitarist. In February 1996 the quintet released its fifteenth studio album,"Purpendicular", which was followed, two years later by "Abandon", both failed to penetrate the top 50 in the U.K. and never charted in the States. In the late '90s numerous live-albums, collections, box-set were released; the production continued in the new millenium with 2003's "Bananas", the band lost their founder keyboardist Jon Lord, his replacement was Don Airey; formerly of Ozzy Osbourne and Rainbow. 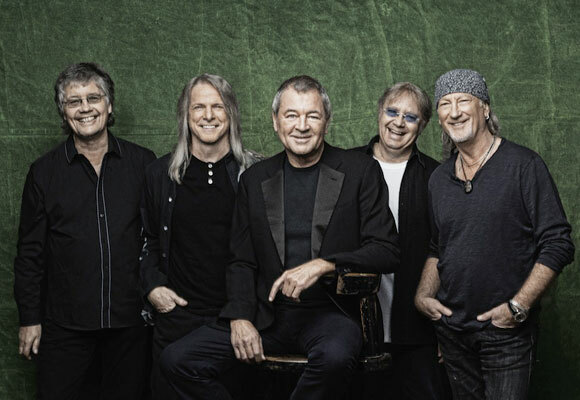 Deep Purple released their next album, "Rapture Of The Deep", in October 2005. Eight years later, the group confirmed the release of an album completely made of new studio material. "NOW What?!" is expected in stores on April 30, 2013.